*Somewhere else and More than one residence – use with caution. Notes: This category includes parents with two or more children who do not live at the same primary residence. 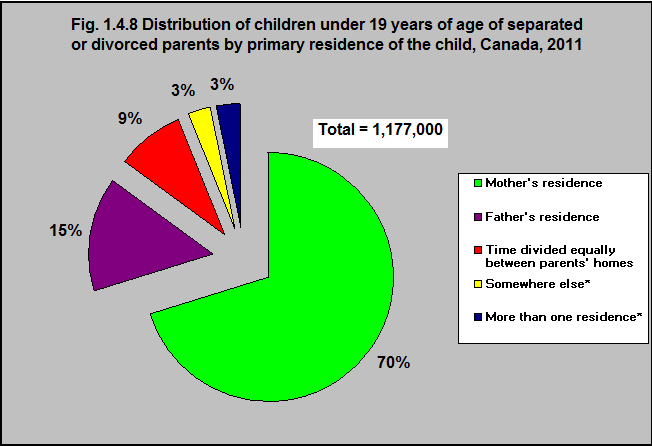 Includes parents with one or more children (aged 18 years and under at the time of the survey), who do not all live at the same primary residence and who separated or divorced within the last 20 years. Totals include the “don’t know” and “refused” categories, which are not shown in the table. Percentages may not add to 100%. Source: CICH graphic created using data adapted from Statistics Canada, General Social Survey, 2011. http://www.statcan.gc.ca/pub/89-652-x/2014001/tbl/tbl01-eng.htm – accessed July 18, 2017. In 2011 there were almost 1.2 million (1,177,000) children under 19 whose parents were divorced, separated, and who did not all live at the same primary residence. The majority, 70%, of these children and youth, lived primarily with their mother. 15% lived primarily with their father and 9% divided their time equally between their parents’ homes.